enlightening me to these numerous 3rd Party feeds of our inventory! Thanks for the heads-up Alpha Dawg! MANY OF THESE ARE VERY MUCH UNWANTED FEEDS!!!!!!! *Watch this quick video how to remove these UNDESIRABLE 3rd Party Feeds from Dealer Specialties! **Share this with any & all of your Automotive Industry Colleagues! @ Jim - Thank YOU very much! Let`s keep shakin` those trees! Hope all Dealers share this thread with anyone & everyone they know in the automotive industry! Thank you Ken for this wonderful video "How to Remove Unwanted 3rd Party Inventory Feeds on dealer Specialties" We have another video on my blog How to do it on Homenet too... Cockroaches Scatter when We Turn the Light On." My pleasure Jim! Let`s keep the boat rockin`! We advertise and disclose every place we send data and any time it has looked like some company might be doing something harmful or shady, we have stopped them. In almost all of these cases, these are classified listing sites where dealers want to be. In fact, we have lost business to competitive companies who will send to these sites. For instance, Brian Pasch pointed out a site a couple years ago that using dealer's listings to do a bait-and-switch, we immediately cut that vendor. Almost all of our competitors still send data to that company. The two things you are missing here, in days gone by... if you had placed an ad in the newspaper and the newspaper used that ad to do a filler in an additional publication, would you care? Of course, not more exposure for your vehicles! That is all we have done here for the dealers and in the rare case that a dealer wouldn't want that, they can easily remove. In many cases, these are "billboards in the desert" that very few people see. Secondly, the dealer is not paying for exposure on these sites. I can understand the point of where you guys have a complaint with a lead provider recommending other competitors vehicles when the dealer is paying that but we aren't a lead provider. @ Glen - I have utilized Dealer Specialties & I have never been told nor shown where to edit these 3rd Party Vendor/"Partners" on the back-end side of Dealer Speciaties. "any time it has looked like some company might be doing something harmful or shady, we have stopped them"
Really???????????????? What would be your explanation in regards to AutoREF.com? When you pick three vehicles for your "Garage", then they force you to submit your personal finacial information before you can continue on their site. Now as a dealer Glen you have to wonder what`s the end game here??? To actually sell back a pre-qualified lead to the dealer whose inventory is unknowingly being posted by AutoREF?????? Sooooooooooooooooooooooooo here`s the question Glen............. Who profits from this arrangement??? Dealer Specialties who receives a fee from these 3rd party vendors to access our inventory?? 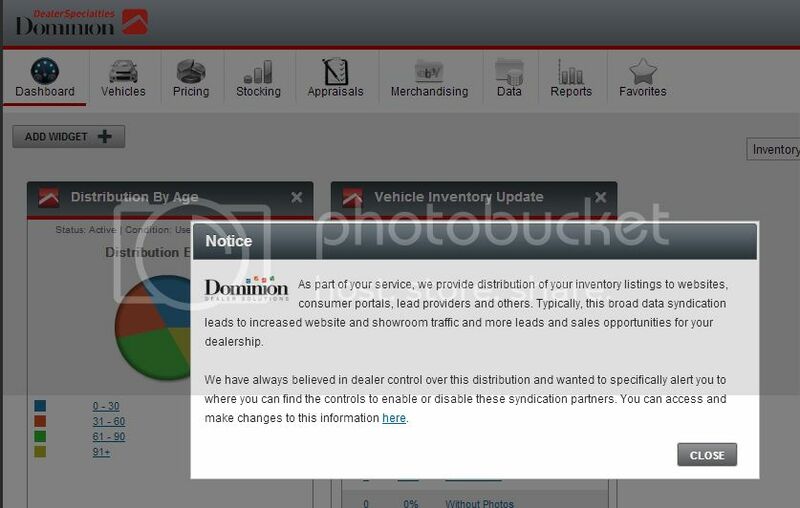 3rd Party vendors like AutoREf.com who sell pre-qualified leads back to the dealer?? Certainly not dealers like us, who do not do business with these 3rd Party vendors in our Dealer Specialties Feed!! Glen as a matter of fact Dealer Specialties IS in fact an indirect lead provider as you`re selling dealers inventory feeds to a 3rd Party Vendor who attempts to utilize these dealer inventory feeds to gather leads to ultimately sell back to a dealer! First, while I only know you on a surface level, I've spent 20 years in this industry and you are going to be hard pressed to find anyone who is more pro-dealer than myself. My grandfather was a Chrysler-DeSoto dealer and I am a dealer guy. I'm quite certain there are many places on the admin site for dealers that you may not be aware of this and this partner add, change, delete section is just one of those. We tried to make it as easy as possible. As for your insinuation about the profit we get from this, we typically charge a "handling" fee for setting up a new feed as it requires some of our developers and support but it is laughable how low it is. It's less than a hand of blackjack for Jerry Thibeau, I'll tell you that! It is not a profit center for us. Why I call this unfair is because we are the biggest, we are the biggest culprit? I don't think so... and I'm likely the only one who is apt to reply to this. Glen listen........... The only point I want to make is this, Dealer Specialties should be more transparent in the existence of these 3rd Party Vendor sites. Plain and simple. Here`s my concern Glen, I have never had one single customer come from thes 3rd Party Rogue Sites. My question is what are these vendors doing with the customer`s financial information that they gather???? Presumably they are selling it back to dealers. 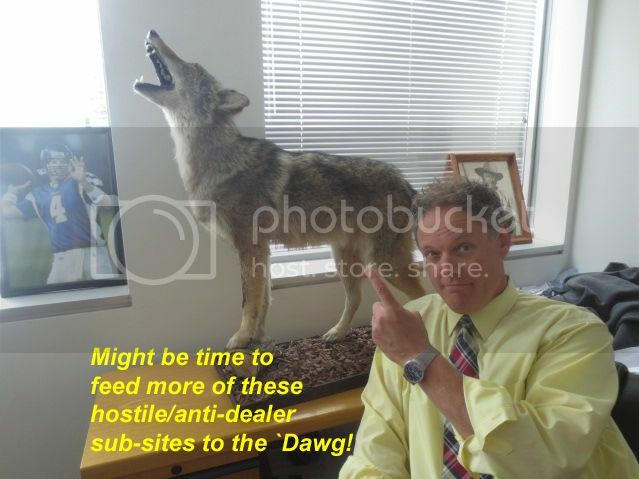 Since Dealer Specialties is allowing this functionality I don`t consider this practice to be considered "Pro Dealer". Hey Ken... just an FYI... when people login to IVM they are going to get a prompt that highlights this issue and an explanation of how to turn on/off any of these feeds if they didn't know where it was before. Excellent Glen! I`m very glad to see that Dealer Specialties decided not to take the "Dark Path" of the unknown but decided to remain on the "Brightest Road" of transparency with their clients.....the dealers..... Thank you. They are a small company starting up. Actually spoke to their CEO today. Seemed like a decent guy, Mike. I commended Dealer Specialties on all of the Blogs for having a way for dealers to eliminate websites they wanted deleted from their feeds. The one website that we all have a problem with seems to be CarGurus.com, viewed by many as an anti-dealer hostile site. Dealers are NOT content just to have exposure if that exposure turns out to be hostile or anti-dealer. If a dealer doesn't want to have inventory feed going to any site, he/she should be able to delete that from their feed. We are excited you have that feature available as does HomeNet. So, whether its AutoRef, or CarGurus, or CarSoup... I think each dealership that pays for your services has a right to delete any website they don't like from the feed. There are many websites I am sure they would be glad to have their inventory displayed BUT others who take it upon themselves to rate our pricing (which is none of their damn business) like CarGurus will tell a customer your price is a "Bad Deal" or they rate your dealership based on sketchy criteria which seems to favor their paid inventory customers, just sayin'. And then one of my dealers just today got a follow up email from CarGurus offering him (Get This) 161 additional cars in the area at other dealerships he might consider. I can't picture any dealer voluntarily wanting anything to do with these jokers.